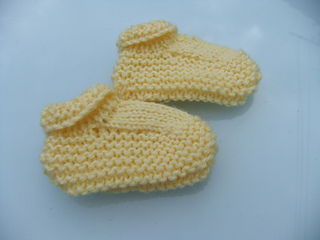 These booties can be knitted in 3ply, 4ply or Double Knitting weight yarns. Only small quantities of yarn are needed. If using 3ply yarn, use 2.25mm and 2.75mm needles. If using 4ply yarn, use 2.75mm and 3.25mm needles. If using Double Knitting yarn, use 3.25mm and 4mm needles.